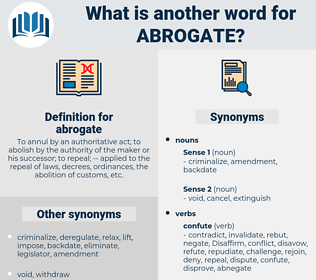 What is another word for abrogate? To annul by an authoritative act; to abolish by the authority of the maker or his successor; to repeal; -- applied to the repeal of laws, decrees, ordinances, the abolition of customs, etc. Abolished, Annulled, Canceled, scrapped, cancelled. abolish, Abolishing, cancel, cancelled, annul, nullify, terminate, remove, derogate, negate, invalidate, waive, lift, overrule, delete, reverse, supersede, relinquish, forego, discontinue, dismantle, vacate, eradicate, forgo, erase, forsake, quash, abolition, avoid, suppress, suspend, undo. revoke, rescind, eliminate, Eliminating, overturn, abandon, withdraw, override, abort, scrap, renounce, dissolve. cherish, promote, prescribe, decree, pass, enact, permit, legitimize, endorse, allow, legislate, order, validate, legalize, support, clear, revive, warrant, renew, lay down, sanction, ratify, reinstate, repair, confirm, authorize, approve, restore, set up, legitimate, continue, command, sustain, mandate, formalize, found. We talk about the power of the will, but no effort of will can obliterate the life that we have lived, or add a cubit to our stature; we cannot abrogate any law of nature, or destroy a single atom of matter. Confronted by the new and threatening forces in France, Pitt was virtually compelled to abrogate a system under which the Speaker of the Irish House of Commons, and Ministers who had no definite responsibility, could meddle in military affairs. affricate, abreast, appreciate, average out, apricot, abreact, apiarist, affright, aforesaid, approach shot, appressed, appreciated, afforest, aphorist, average cost.